In December 2006, I was invited to be guest editor at coudal.com, an opportunity which I jumped on, having avidly gobbled up their digital offerings for years now. 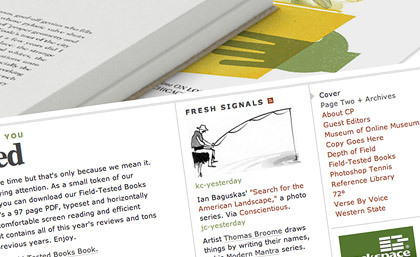 Normally, guest editors just contribute links; however, Jim Coudal suggested that I contribute illustrations as well. And being a much better picture-maker than link-scrounger, I jumped on that chance like frogs jump on National Jumping Day Pogo-stick Trampolines. You can view all 34 illustrations by clicking "next" or "previous" in the movie below. Enjoy! You Can Never Have Too Many Santas. Illustrators unite to destroy flying rats. A carnival, frozen in time. Build yourself a meltable slave!